When I was little, one of my favorite things was a bed-time story. As the book cracked open, the world stopped turning and everything but the sound of my parent’s voices went silent. My mother and father would sit on the edge of my bed and unlock the magic of a book which I selected. 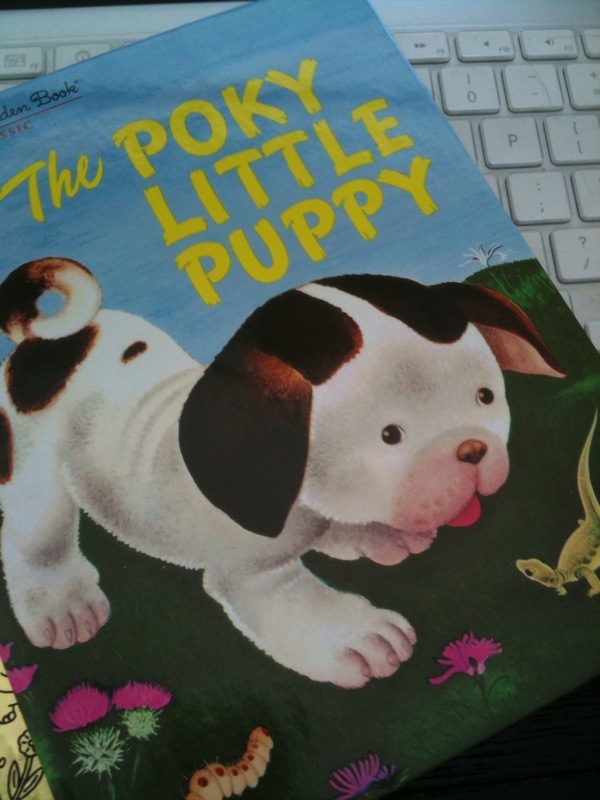 We probably read the Poky Little Puppy a million times, but it was the way my parents read with distinct character voices and story of the puppy’s problem with curiosity on top of the high importance they placed on reading that made a lasting impression on me. Now, as a marketing professional, I often think back to the magic of storytelling and engage business owners to tell me their story. All of these are great facts and important to “building the story” but they aren’t the main story, just a part. This is where the story can become very interesting, so I encourage them to tell me more. I then ask, “What was the motivating reason you or the owners decided to open the business?” Defining your passion offers an intriguing first chapter. Have you ever considered why you began your business? Have you ever told this to your customers? Is it different from the way you do business? Do things need to change? How do you begin your story? It was magical to hear my mother speak like a puppy. As a kid, it always made me giggle, but more than that, it was memorable. Giving your current clients a voice is the next important chapter of your company’s story line. If you haven’t asked your clients how your working relationship is going, now is the perfect time to do so. Asking clients to offer their perspective, in their own words and in their own voice is a great way to learn what is working, tighten your bond and give each client a more defined customer experience. Remember: When marketing and promoting your business, testimonials are king. What your clients are saying about you can make or break your business. After three months of engaging a new client, do a gut check. See what they think, ask what they like and don’t like. Finally, ask if they will write out a testimonial for you to use in you future marketing efforts. One of the hardest challenges each night before bed was choosing. I had a huge bookshelf stacked with books, each one my favorite (kids think everything is their favorite!). However, The Poky Little Puppy was my favorite, favorite! Why? Well, of course, hello, it had a dog in it (total bonus) and two it had a story line that resonated with me. This little ball of fur was curious and it was his curiosity that constantly got him into trouble. Unfortunately, I had the same trait growing up, well and quite honestly, still do. I say all of this to bring home the fact that telling a story that interests, engages and emotionally draws your customer into your story is key. By knowing what is important to your customer base, talking to them with words and phrases that resonate and unfolding the story in a way that nudges their emotions are all great ways to craft memorable tale. So the next time a customer asks why you’re in business or even why they should buy for you, will you have a story to share with them? What a great insight USA Today provided recently in their article denoting that how simple sells. I talk about this a lot and firmly believe in the less you say, the more you tell. USA Today goes on to state that simplistic marketing tactics are expected to be king in 2010. Oh be still my beating heart!! Besides the fact that they are all well established brands, they have one brilliant thing in common. Their marketing message, look and promotional insight are all simply executed. No flowery words. No extra fluff. It’s ONLY what they do, how the do it and what benefit they provide to their customer. I offer this thought in reaction to the new trend expected for 2010 … How can you simplify your current marketing message? 1) Focus on the reason your top five customers choose you over your competition. What you haven’t had that conversation? Now is the perfect time to start. Give your favorite customers a call. Ask them why and how they decided upon you. 2) Promote only one thing at a time. Don’t have an offer on every single page of your web site that is different. Be direct. Be focused. Offer only one thing, one incentive or one benefit at a time. With all the media circus that is around us, one direct, focused message can really stand out in the crowd. 3) Think like your customers. How many times have you fallen into the trap of creating marketing messages, advertising pieces that you like, only to find out your clients didn’t “get it”? Step back from your industry talk, put yourself in your consumer’s shoes. What is it that you would like to know about the product or service you are in the process of purchasing? What are some of your objections to buying the item? What factors have come into play that made your potential customer choose a competitor over you? Not sure what the answers are to these questions? Get busy doing the research. Once you find that one thing-focus in on that and only that. Okay so I must admit that I have been hooked on the iPhone since it was first released. I have drunk the Apple-favored Kool Aid and feel somewhat lost when I misplace the phone. As I talk with many of my clients I discover that they too, whether or not they have an iPhone, feel unorganized and somewhat lost without their smartphone to guide them. So, when I stumbled across an article about Mobile Marketing in a recent edition of Ad Age, I thought I must share the article with you. Not only are we headed to a time when people are more connected than ever to one another, they are connected through their mobile devices, spelling opportunity to business owners. According to the Ad Age article, many experts in the mobile field expect the mobile marketing industry to explode and become an “apps-focused” reality. Many large corporations are looking into the mobile realm and developing apps that not only promote their brand, but push it in an innovative and engaging way. All of this got me to thinking what is it that marketing consultants and creative advertising gurus can do to make their client’s brand (pardon the pun) “ring in people’s ears?” If it’s not an app, what is it that will engage your customer to react and stay engaged with your brand? We at dog-eared pages would love to hear your thoughts. Why Do I Need a Marketing Plan? Earlier this week a business associate asked me a very important question that I have been asked many times. At first I wanted to say, ummm, that’s kind of like asking me, “Why do I need wheels on my car?” To me, a marketing plan is just something you must have to make your business successfully work. It’s like putting on your shoes to go outside or placing toothpaste on your toothbrush … it is just something you do to complete the end goal, right? Here are my Top Three Reasons You Need a Marketing Plan in Place. Your Road Map To Success. You wouldn’t begin a road trip to an unknown destination without at least looking at a map. Right? So think of your marketing and advertising journey in the same light. When you begin to plan your marketing tactics for the upcoming year (HINT: now is the time to start doing so, DEP can help. ), begin with your end goal first. As you think about that goal, define where you want to be financially, how many qualified leads you plan to bring in each month/week and how much you plan to spend for the year to meet these goals. Target the Right Market. If you feel you were a little short this year in achieving your goals, reevaluating your marketing tactics, approach and execution are all good places to start. Many times I find my client’s aren’t “speaking” to their target market in a way that captures their attention and prompts them to act. Even more frequently, I see business owners lacking the understanding of who their target market is, much less talking to them. Every year I encourage clients to reevaluate their target market. Ask yourself the following questions: What do most of my clients have in common (i.e. all doctors, like to spend time with their kids, in a certain age group, spend X amount of hours on the road each week)? Where do they go to learn more about the products/services I offer? What is the number one thing they keep telling me is a positive aspect about my business? Set benchmarks for success. Just like a professional athlete sets personal achievement goals for their workouts each week, as a business owner, you too should be measuring your success and even your failures on a weekly basis. When you begin crafting your marketing plan, think about what goals you wish to achieve each week. Do you want to sell 25 new widgets a week? How many potential clients should you meet with each week to meet your sales goals? Have you charted where your referrals are coming from? Are you seeking more referrals from these sources? Bottom line, look for measurable items you can add to your weekly schedule and at the end of the week measure off to see your progress. I notice that for many business owners, this can be an eye-opening practice. For instance, I found that in my own business, I at one point was spending 10 hours a week working on my blog. While as a writer having a blog is important, it’s ROI (Return on Investment) wasn’t near worth the time I was taking. Think about what those things are that are taking time away from securing your sale. As you craft your marketing plan or work with someone like Dog-Eared Pages to craft a marketing plan, be sure you remember the reasons why having a plan in place is so important. You might be shocked how it can change the way you do business. For more ideas on crafting stellar marketing plans, check out the following links. Quite a few of my clients are startup companies. I guess I have always been attracted to dreamers and “big-picture” thinkers. So to all of you out there who are searching for ways to continue your creativity pass the brilliant light bulb stage, I offer up this interesting article I found today while searching one of my favorite magazines, Entrepreneur.